Automatic way to break narrow tables into two columns? Is there an easy way to break long narrow tables into two (or possibly more) columns (i.e. without manually rearranging the columns)? Pellentesque sed posuere magna. Ut pellentesque dictum posuere. Mauris at justo ipsum. Maecenas sit amet neque erat, nec euismod nisi. Nullam posuere convallis massa vel luctus. Etiam vestibulum semper lectus, sed ultrices leo aliquet sit amet. Vestibulum in lorem vitae magna scelerisque porttitor ut volutpat dui. Nulla risus felis, molestie et tincidunt sit amet, ullamcorper vestibulum erat. Pellentesque bibendum porttitor velit, at tempor erat sollicitudin at. Sed nec nunc lacus. Sed sollicitudin sollicitudin risus sit amet mollis. Nam posuere tincidunt lacus, ut placerat arcu pharetra at. Proin tempus, orci sed consequat consequat, nulla augue tempus augue, vel fermentum mi augue eget odio. pgfplotstable can do this sort of arrangement. The purpose of pgfplotstable is to load (large) data files and to process them. Its typical use case is to postprocess and pretty-print numerical tables. However, it is also capable of breaking huge columns into two (or three or whatever); and it can also process non-numerical data. It accepts CSV files or files delimited with & and \\. However, it is NOT tabular: it expects "raw data" and generates a suitable tabular. While it can easily handle the task to dynamically balance multiple columns, the cost for you is to learn how to reinsert your "old" formatting instructions like \hlines or \multicolumns. You will also have to learn how to assign column display names, how to add any vertical lines or so. It can do all these things, its just different because the tool has a different use-case (it assumes that there is no tabular, only a data file). One method is to collect the body of the tabular using Will Robertson's environ package, then reorganize the rows using LaTeX3 code. First separate the rows and store them into a "sequence variable" (in other languages that would be called a list) using \seq_set_split:Nnn. Since the table ends with \\, the resulting sequence ends with an empty item. 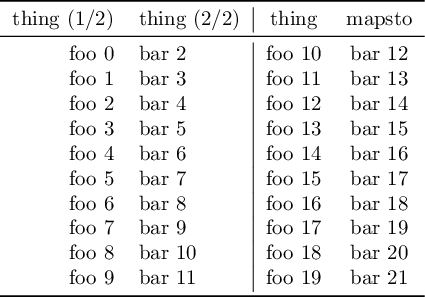 The first item of the sequence (the first row of the table) is the header, which we will have to repeat. We can "pop" that first row from the sequence and store it in \l_DT_header_tl for later reuse. Then pop the next L/2 items from the sequence, and store them into another sequence, where L is the length of the initial sequence (number of rows in your table). We now have two sequences, contents_A holds the first half of the table, and contents holds the second half. Here comes some magic function (which only exists for two sequences, otherwise we'd have more work), \seq_mapthread_function:NNN, which allows us to take items from both sequences in parallell, and hence typeset them side-by-side: \DT_one_row:nn takes one item from each sequence and expands to one row of the result, #1&&#2\\. % Split the table between "contents_A" and "contents". Not the answer you're looking for? Browse other questions tagged tables page-breaking two-column or ask your own question. How do I create a single-page frequency table instead of a long table for LaTeX in Stata? Listing over two columns - how to page break?